I didn't run yesterday but I took a three mile walk at lunchtime to Central Park. My route followed the lower loop and I included a few side paths as well. It was perfect weather for walking, bright and sunny, but cool enough for me to be comfortable in my suit jacket and tie. I watched enviously as runners, cyclists and in-line skaters passed by. I really wished I was running on the bike path rather than walking along the pedestrian strip. The park was filled with people, but my surroundings had a quiet (but positive) feel. Central Park is truly an oasis within mid-town Manhattan and I wanted to spend more time on my walk but I really needed to head back for a meeting. The only negative was that all that walking was rough on the bottom of my feet and I was in a little pain by the time I'd returned to the office. This morning I went out for my first run since Sunday's race. Due to resting for two days prior and one day after the race, I've only run about 10 miles over the last seven days. It was great getting out at 4:00 AM but it felt far chillier than the 49 degrees that the local Long Island television station reported. I was concerned that the irritation from yesterday's walk would have a negative impact on today's run but with a good pair of socks and my trusty GTS 10's, I had no issues at all. I started my run on a street with a slight (~2%) elevation and re-lived the running of the big hill on Sunday. Of course today's challenge was shorter and far less steep. It was just enough to get my body temperature to a comfortable place and I headed into the next series of roads, listening for the chirp that would tell me I'd passed my first mile. I encountered no cars and the only sounds were birds (and my Garmin) chirping, interrupted occasionally by the clattering sound of a lawn sprinkler. I felt I ran harder than normal and ended up averaging 9:06 per mile, which is a good pace for me at that early hour. 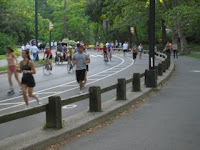 Note: I want to give a shout out to my friend FS who also raced on Sunday (NYRR "Run as One" 4 miler). She maintained an impressively fast pace (low 9:00's) - a possible PR for that distance. I have visited Central Park and was in awe of the beauty of it. To be in the middle of all that hustle and bustle. I know the feeling of being at work and wanting to run, and having all the energy to feel like you can run 10 miles, but you're at work and can not. Glad you could make it out with the birds, and sounds as though you had a great morning run. Thanks Kenley. I'm planning to hit the park every Friday afternoon between Memorial Day and Labor Day for a run before heading home. I only wish my company provided showers!